Note: This project is a reader submission from Rick in St. Paul, MN. 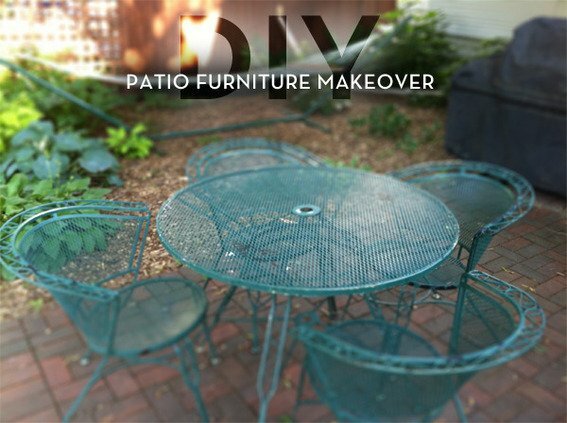 We loved his colorful wrought-iron patio furniture makeover, and wanted to share it with you. Have a project you'd like us to share? Send us an e-mail to tips@curbly.com. That's the question my uncle asked me earlier this summer. It was a bit of a loaded question, especially when he told me that he was going to throw it away if we didn't want it. Hmm... if he was tossing it, why would I want it? But once we looked at it, my wife and I loved the design and knew with some new paint, it would look great in our back yard. These wrought iron pieces used to be my grandparent's. We loved the history of the furniture and were excited to give it new life in the family. There was a table with four chairs, two lounging chairs with foot rests, one springy chair and a small table. We decided to use two different Krylon spray-paint products: a rust protector paint for the table and chairs (always a good idea for outdoor furniture), and the Krylon Dual paint on the other chairs and small table. There were a lot of great colors to choose from and as you can see from the pictures, the green color that we received was in tough shape. My wife decided on the Gloss Burgundy for the table and chairs because it went well with the cushions that we already had. Then, for the other three chairs, we wanted some bright colors for our lawn. We have two young daughters and we allowed them to each pick one color for a chair. My oldest daughter (9) chose Mandarin and my younger daughter (7) chose Watermelon. Then we decided on Banner Red for the final chair and True Blue for the table. The first step was to take a wire brush and get off all of the loose paint. This was a job for the whole family. Krylon also suggests using sandpaper, which was helpful for the small decorative details. Once all of the loose stuff was off, some sandpaper made all of the paint edges smooth. It took a couple of hours to do all the pieces. We kept the furniture over a tarp, which made the cleanup a snap. Once the pieces were ready, we placed them over a piece of painters' plastic and started spraying. As a typical DIYer, I thought I knew best about how to apply the paint. I read the directions about applying thin even coats. They suggested even passes over the furniture with some overlap. Of course, I put way too much paint on for the first chair (Watermelon). That meant I got some color streaks, uneven coverage and ran out of paint before totally covering the chair. So, on the second chair, mandarin, I did exactly as the instructions suggested. It took three coats, but I had more than enough paint and got a nice even finish. I applied each coat after about 15 minutes, starting each pass off of the furniture and applying a light, even coat across the piece. Once it dried, I turned the furniture over and did the other side. I took turns rotating between pieces and colors so that I didn't have any real wait time between coats. This worked great! I worked in the sun, and this made it a little difficult to see all of small spots I might have missed. Once the clouds showed up, it was much easier to see where I missed. I left them on the tarp for about an hour before I put them back in the yard. They were a little tacky, but after a few hours, they were ready. We ate on the big table that night, having finished painting around 1 o'clock in the afternoon! My whole process took about four hours from start to finish. Not bad for a heat of metal that was on the verge of being scrapped! Now we have some great looking, comfortable chairs that are really fun for our back yard. It was a great excuse to buy some new outdoor dining accessories. The color and the history of the chairs are a great conversation piece, and we spend a lot of time on our “new” furniture! The lounge chairs, bouncy chair and table set are amazing! Salterini? I believe! Now that this post is a couple years old, can you tell me how the paint has held up? Has it been scratching off easily or holding true? I forgot to remind you ALWAYS WEAR SOME KIND OF MASK( cotton scarf wrapped over your nose and mouth) for safety when spraying anything. The royal blue is very chic, and shows the table ware of beautifuly. Presumably you can use a light tone if you have dark tableware. Another variation i see possible is to draw and cut out a carboard stencil for the back of each chair eg." Where do i sit?" "Oh! the White Rabbit Chair or the gold fish if you like! I have the dragon fly chair and Bill has the Turtle" Anyway this is a case of recycling at its best, when you revive something destined for the trash, make it beautiful and then share it. Well done. I love Curbly, especially the DIY projects. This was a great job, and it reminds me what a wonderful tool spray paint is. But I have one question: Why do some people comment on the color (or other choices) if they don't like it? These things are personal decisions. If you don't like the color, why comment at all? Choose the color that YOU like! I can think of a whole lot of words to say to describe the treasure you have there, but instead I'll just say....WOW! I'm glad you re-energized the table & chairs. Love that you went wild with color. Great job! Great family project; love that the kids got involved. I see they like to use it too! These should be around for you to give to your grand kids. I applaud your energy and intentions, but I have to say I think the old color was best. Love it! You have inspired me to spruce up some of my outdoor furniture.